Bringing the team some good luck! 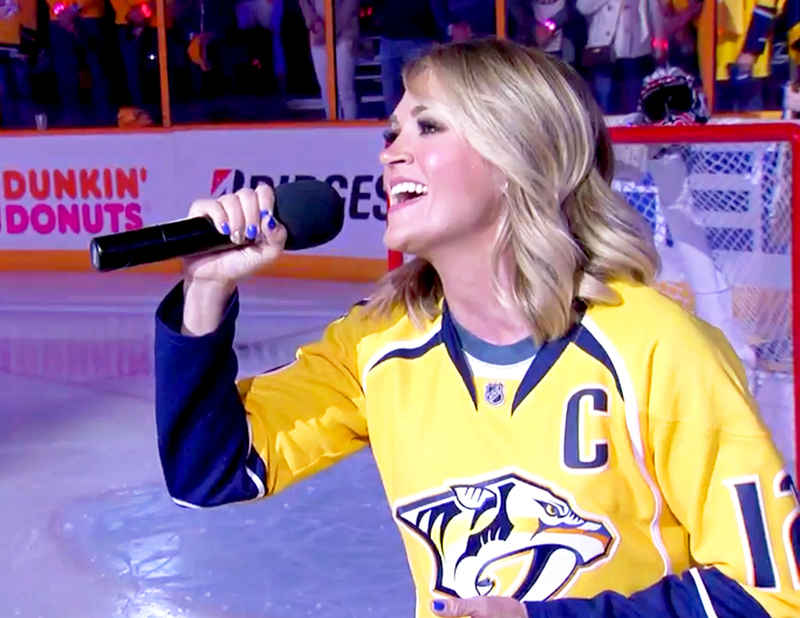 Carrie Underwood surprised hockey fans at Nashville’s Bridgestone Arena by performing the national anthem before her husband and Nashville Predators captain Mike Fisher’s Stanley Cup playoff game against the Chicago Blackhawks on Monday, April 17. Watch her performance in the clip above. 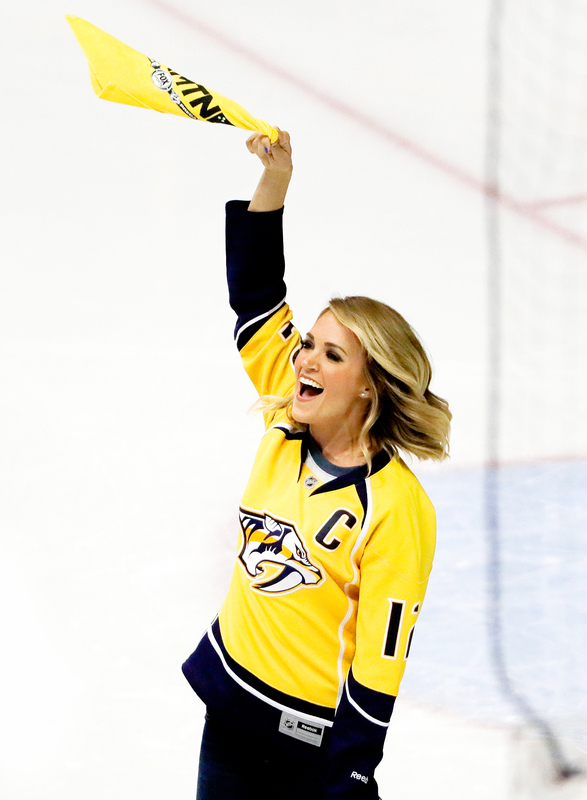 Carrie Underwood performs the national anthem during the NHL hockey playoff series between the Nashville Predators and Chicago Blackhawks in 2017. “Please rise and welcome seven-time Grammy winner and longtime Nashville Predators fan Carrie Underwood,” the arena’s announcer said to the sold-out crowd at Game 3 of the best-of-seven series. The “Church Bells” singer, 34, stepped out onto the ice wearing her husband’s No. 12 jersey and with her nails painted in Predators colors — blue and gold. After she belted out a beautiful rendition of “The Star Spangled Banner,” she was joined by Nashville Mayor Megan Barry for the team’s signature towel wave. The pair jumped up and down in excitement and had fans going wild. The American Idol alum — who shares 2-year-old son Isaiah with Fisher — posted a selfie from the game on Instagram in her Predators gear. She rocked a “Smash” snapback hat (the hockey fans have nicknamed the city “Smashville”) and Fisher jersey. She also posted a video of herself screaming and cheering with friends in a suite after her husband’s team won the game in a nail-biting overtime with a score of 3-2. It was the Predators’ third victory in a row, leaving them just one win away from advancing to the second round of the playoffs. “#Smashville has completely gone crazy!!!! 3-0 baby!!! One more! @predsnhl,” Underwood captioned the clip.